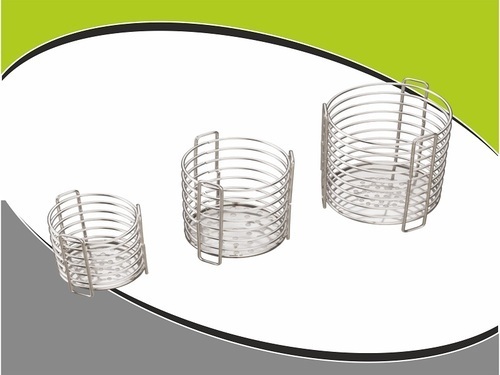 We have carved a niche amid the most trusted names in this business, immersed in offering optimal quality variety of SS Wire Spoon Stand. Using quality assured basic material and cutting-edge tools and machinery, these offered products are made in line with the values set by the nation. As well, these can be acquired from us at market-leading rates in different sizes and stipulations. Incorporated in the year 1920, Surbhi Industries is a best name in the field of Manufacturing, Trading, Wholesaling and Supplying of Stainless Steel Kitchenware Products, Hardware Products and Hotelware Products. Backed with a huge and tremendous industry experience, we are a capable and elegant name who has engaged a team of best personnel so as to ensure that whatever items are shipped to our clients, they are composed of the best quality. Above all, at our premises we are backed with a highly autonomous and up to date machine technology which rather helps in meeting the so many and huge demands of our client. The raw material used in the manufacture of these products is composed of tough and durable items which may enable our company to yield or bring forth products with longer shelf life.